Street vendors figured in the images included in the book Birch's Views, William Russell Birch’s copperplate engravings of Philadelphia as it was in 1800. This view of the southeastern corner of Third and Market hums with the procession of people, animals, and workers among diverse architectural façades. In the center of the scene, Joseph Cooke’s architectural marvel showcases a well-rendered stone arcade and pediment. On the walkway, a market place is set for butchers, produce vendors, and customers that wander about. Some writing beneath the image notes the sale from an R. Campbell and Company, and a manuscript note records its presenter, Thos. Marsh. Today this corner is in the heart of the Old City district. With restaurants and department stores growing in size and scope at the advent of the twentieth century, street vendors faced opposition from merchants, citizens, and elected officials over their cleanliness, legality of their presence, and quality of their merchandise. 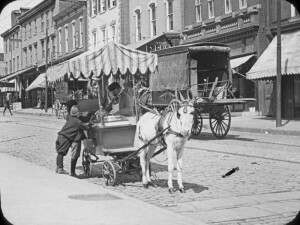 This 1910 photograph shows a street vendor known as a hokeypokey man, with a donkey-drawn wagon, dispensing his treats to two boys on the 5800 block of Germantown Avenue. Hokeypokey man was a slang term in the nineteenth and early twentieth century for ice cream vendors. During the 2000s, public spaces such as markets, squares, parks, and vacant lots provided space for multiple vendors in one location. Food trucks also grew in popularity, often moored to college campuses in places like Newark, Delaware; West Chester, Pennsylvania; and Glassboro, New Jersey, as well as urban squares in Wilmington and Philadelphia. 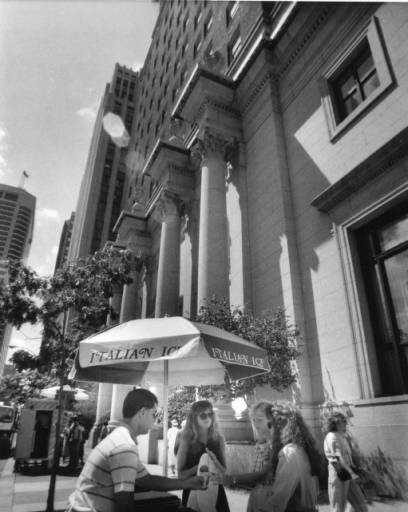 Sidewalk corner vendors go back even further, as in this photo in which water ice, a summer staple of the Philadelphia region, is being sold by a vendor in 1987 outside what was then the Cigna building at Sixteenth and Arch Streets. 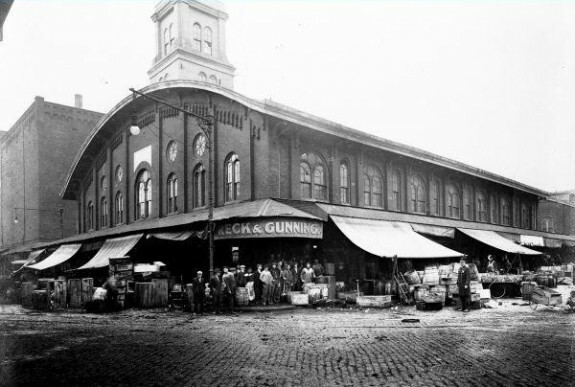 The area of the Dock Street Market in Society Hill was a place of commerce for more than two centuries before it was demolished in 1959 to allow construction of the residential Society Hill Towers. Business owners constructed warehouses along Dock Creek in the late 1600s so ships could unload food, materials, and other products efficiently. The city filled in Dock Creek in 1784 and paved the new land with stones, creating Dock Street. The blocks surrounding Dock Street continued to be popular in the nineteenth century, as hundreds of merchants established distribution warehouses and sidewalk storefronts to sell a variety of food to other Philadelphia businesses and individuals. 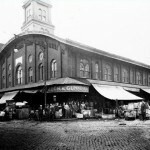 This image from 1914 shows the Fish Market building, an enclosed warehouse that sold fresh fish from dozens of merchants. The Dock Street market diminished in size after World War II as competition from other markets and changes in distribution forced some merchants to move elsewhere. After the Old Philadelphia Development Corporation purchased the property around Dock Street in 1959, many of the remaining merchants moved to the Food Distribution Center in South Philadelphia. 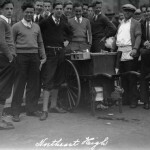 Due to rising public health concerns, Philadelphia in 1922 required food vendors to cover their wares and store them at proper temperatures. Earlier, Trenton (1903) and Camden (1914) were among cities that required licensing of all vendors as well as routine inspections of scales, merchandise, and cleanliness. 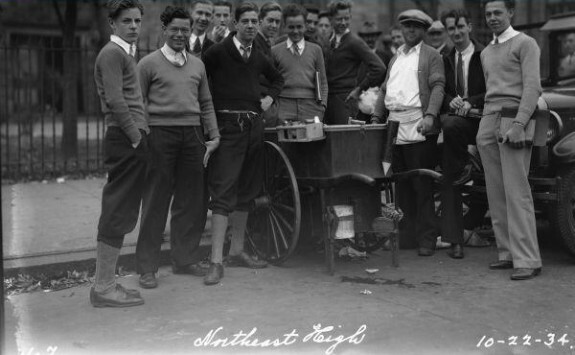 Here, a street vendor is shown with students from Northeast High School in 1934. After a 1940 food poisoning epidemic was traced to a lunch cart in the city’s Northeast, health director Dr. Hubley R. Owen lobbied for firmer regulations. The following April, City Council required all food vendors to obtain licensing, cover their foods adequately, and adhere to strict rules of personal hygiene. Failure to comply resulted in fines between ten and fifty dollars. Vendors argued the restrictions harmed business, and the law proved difficult to enforce. 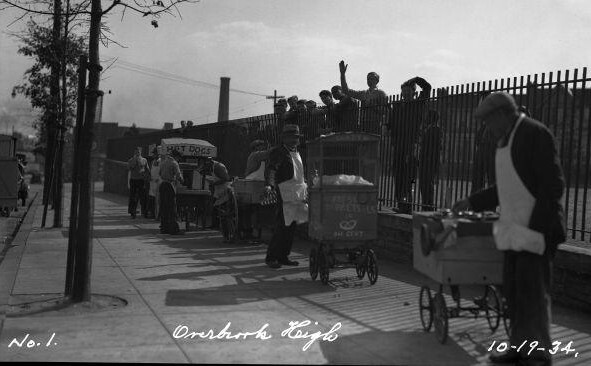 These vendors outside of Overbrook High School in 1934 exhibit signs of concerns for public health by covering their food and wearing aprons. 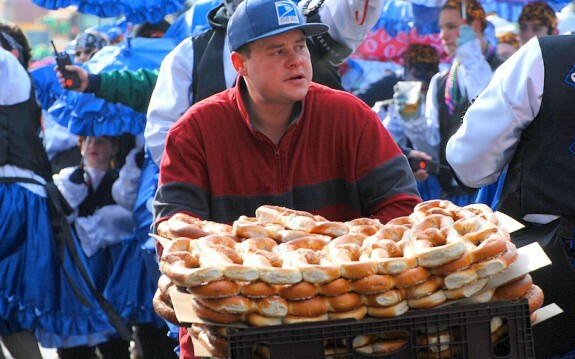 The soft pretzel, a staple of the Philadelphia street vending, first appeared around 1820, sold by Daniel Christopher Kleiss, who is credited as Philadelphia’s first street vendor of soft pretzels. The soft pretzel became popular in Philadelphia thanks in part to the Nacchio family, who started Federal Pretzel Baking Company in 1922 and, in 1930, even sold pretzels to the Philadelphia public schools to be served to students. 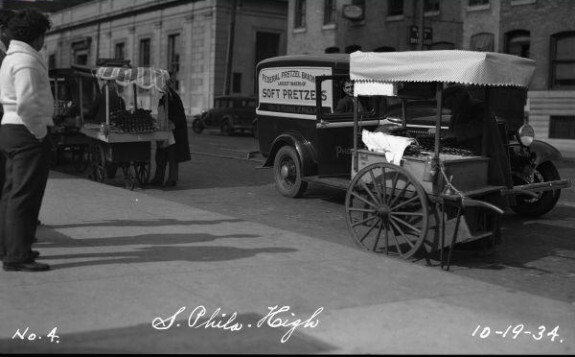 A Federal Pretzel Baking Company truck is shown here, with street vendors outside of South Philadelphia High School in 1934. Two pretzel vendors wait patiently for the students of Stetson Junior High to get out of class so they can sell them snacks. In 1927, Building Inspection Bureau chief Morris Brooks described vendors as “eyesores on our principal streets” and felt they gave Philadelphia a reputation as a city where customers could be easily swindled by larcenous sellers. 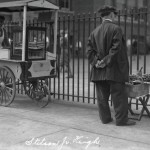 These tensions between the municipal government and street vendors remained throughout the years, though in modern times many Philadelphians regard street vending as positive feature and a sign of the city’s lively, diverse character. During the 2000s, public markets such as Philadelphia’s Headhouse Square and Reading Terminal Markets provided space for multiple vendors in one location. 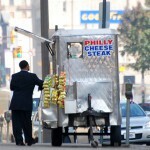 They may be called street vendors, but many Philadelphia food carts have regular spots on the sidewalk. This one was on North Broad Street in October 2008. 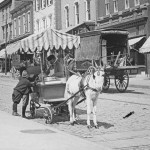 From the colonial period to the present, street vendors have been integral yet contentious features of Greater Philadelphia’s economic landscape. Providing massive numbers of customers with food, clothing, and other goods while allowing many working people an occupational foothold in the region, vending also sparked controversies regarding taxes, regulation, public health, and uses of space. The region’s earliest street vendors (or “hucksters”) congregated without regulation in streets and alleys close to Philadelphia’s waterfront. Although some vendors resided within the city, others journeyed to town by horseback or ferry from the countryside. 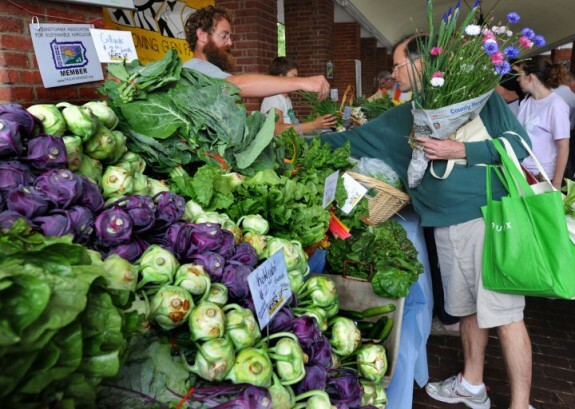 Using carts, baskets, and buckets, they sold fruits, vegetables, seeds, dairy products, and meats to eager customers. 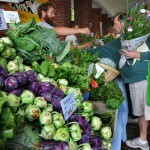 Other popular wares included buckwheat cakes (a breakfast staple), South Jersey produce, oysters, and pepper pot soup. The soup, selling for pennies a bowl, became internationally famous. Many “pepper pot women” were free blacks, with some, including Flora Calvil and Polly Haine, gaining recognition for their theatrical cries and elaborate costumes. To the south, at Wilmington, Delaware, vendors gathered at the heavily trafficked Brandywine Bridge in the 1700s to sell wheat and other grains grown in New Castle County and southeastern Pennsylvania. In Philadelphia, female hucksters sold poultry, nuts, and homespun goods in the High Street market stalls (the largest in the colonies) between Front and Fourth Streets, and vendors also found customers at stalls erected in Southwark (1745) and Northern Liberties (1763). Following the French Revolution (1789) and Haitian Revolution (1791-1804), which brought numerous goods and refugees to Philadelphia, vendors began selling French pastries and Creole items. “Exotic goods” were offered near the Willow Street Wharf, the city’s first “red light district.” The lowly status of both prostitutes and female vendors merged in public opinion to represent a shared ill repute. After the American Revolution, Philadelphia merchants complained that street vendors destabilized prices and undercut profits. As a result, in 1789 the city imposed restrictions on public market space so that vendors could sell only in the market (and not on surrounding streets) during regular hours and could not offer merchandise purchased outside the city limits, which would create competition for licensed stalls or stores. While many vendors simply paid fines for violating the new rules, others moved locations, hid products from inspectors, or petitioned the city to lift the restrictions. 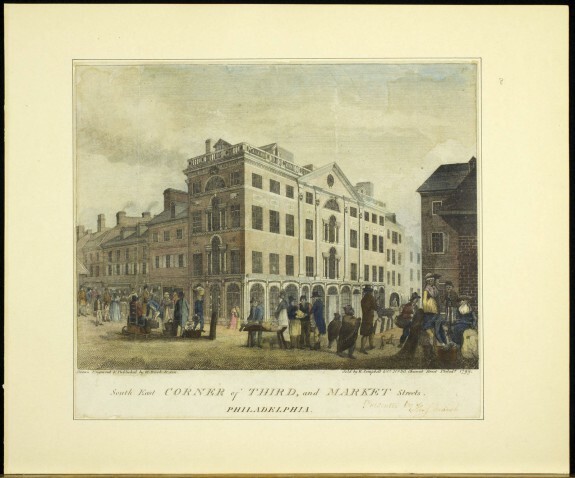 After much protest, especially from female vendors who were poor, elderly, or disabled, the Pennsylvania Assembly in 1802 lifted the restrictions to allow vendors full access to Philadelphia’s markets. 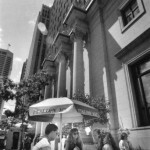 However, tensions between vendors and the city ebbed and flowed for many decades. As the ethnic composition of the region diversified with immigration during the 1800s, many newcomers settling in ethnic neighborhoods in Philadelphia, Camden, and Wilmington found work hawking items from linens and bananas to jewelry and tea. 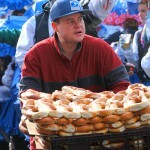 Daniel Christopher Kleiss was credited as Philadelphia’s first street vendor of soft pretzels, which appeared around 1820. 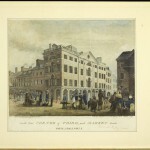 Other food vendors worked near the city’s Delaware (later Dock Street) Market, established in the 1850s. Dock Street remained a thriving yet overcrowded draw until its demolition in the 1950s. In Philadelphia’s Jewish Quarter along South Fourth Street (“Der Ferder” in Yiddish), vendors sold fabric, sewing supplies, and curtains from pushcarts. 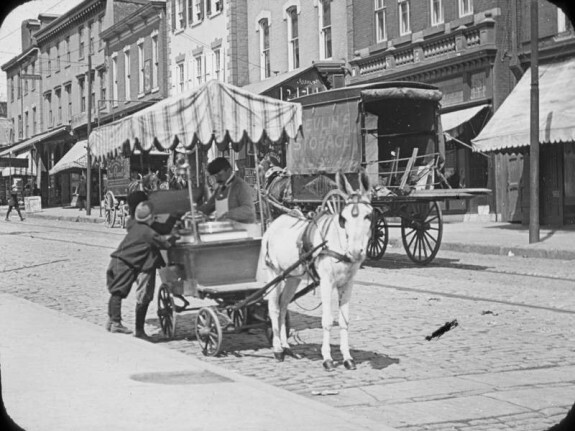 Vendors of “Jersey sausage,” a corn-fed pork variety made by Camden’s sausage weavers, sold their wares along that city’s Market Street well into the 1890s. The “hoagie” sandwich appeared in Philadelphia’s Little Italy and along Camden’s Benson Street in the late 1800s. In efforts to burnish vendors’ image, West Indian women who sold pastries in Center City dressed in crisp white uniforms. 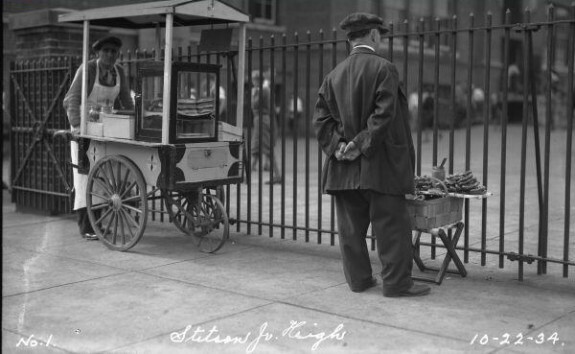 With restaurants and department stores growing in size and scope at the advent of the twentieth century, street vendors faced opposition from merchants, citizens, and elected officials over their cleanliness, legality of their presence, and quality of their merchandise. Merchants objected to differences between “curb prices” and “store prices” as vendors often undercut storefront businesses. Cities, including Trenton (1903) and Camden (1914), required licensing of all vendors as well as routine inspections of scales, merchandise, and cleanliness. 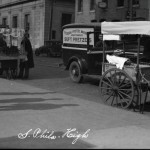 Due to rising public health concerns, Philadelphia in 1922 required food vendors to cover their wares and store them at proper temperatures. Five years later, Building Inspection Bureau chief Morris Brooks (1888-1958) described vendors as “eyesores on our principal streets” and felt they gave Philadelphia a reputation as a city where customers could be easily swindled by larcenous sellers. 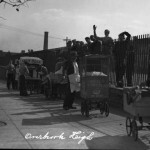 During the 1940s and 1950s, tensions over Philadelphia’s street vendors intensified. After a 1940 food poisoning epidemic was traced to a lunch cart in the city’s northeast, health director Dr. Hubley R. Owen (1883-1955) lobbied for firmer regulations. The following April, City Council required all food vendors to obtain licensing, cover their foods adequately, and adhere to strict rules of personal hygiene. Failure to comply resulted in fines between ten and fifty dollars. Vendors argued the restrictions harmed business, but the law proved difficult to enforce. Beginning in 1950, Fabric Row shop owners rallied against (and successfully banned) pushcarts. With Center City then undergoing renewal, police routinely cited or arrested vendors for health code violations, not displaying permits, or using vulgar language. With many families decamping to suburbs and shopping malls through the 1960s and 1970s, African Americans and Asians increasingly made up the majority of Philadelphia’s street vendors. Along West Philadelphia’s Fifty-Second Street, West Indian and African vendors offered oils, batteries, and hair clips. Beginning in the mid-1960s, Korean vendors arrived in Philadelphia from New York and sold wigs, handbags, and accessories along North Fifth Street and in Upper Darby, Pennsylvania. On the campuses of Temple University and the University of Pennsylvania, vendors (many of them unlicensed) offered T-shirts, incense, jewelry, and fast food such as pizza, egg rolls, and hot dogs. In the 1970s, future Pennsylvania State Senator T. Milton Street (b.1941) and his brother John F. Street (b.1943), a future two-term Philadelphia mayor, sold hot dogs on Temple’s campus. Routinely harassed by police and inspectors, the brothers, reportedly the university’s first black vendors, helped form the Black Street Vendors Association to legitimize their businesses. By the end of the decade, Temple constructed a permanent court to house roaming food vendors while allowing non-food vendors to remain on selected corners. At the University of Pennsylvania, where street vending had operated since the 1910s, codes of conduct and spatial limitations were imposed in the 1990s to better regulate the campus’s nearly 100 vendors. During the 2000s, public markets such as Philadelphia’s Reading Terminal and Headhouse Square provided space for multiple vendors in one location. Food trucks also grew in popularity, often moored to college campuses from Newark, Delaware, and West Chester, Pennsylvania, to Glassboro, New Jersey, as well as urban squares in Wilmington and Philadelphia. Philadelphia in particular contained a vibrant food truck scene. In 2011, the New York-based Vendys held its first competition, naming Drexel University’s Cucina Zapata (tacos) and Sweet Box (desserts) best in the city. Other food trucks changed locations daily, alerting customers via social media. Despite firmer regulations, vendors still illicitly hawked T-shirts, scarves, and other items throughout Center City Philadelphia. With vendors outnumbering inspection agents, those operating illegally often did so without concern. 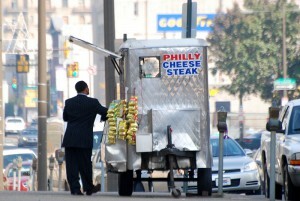 For centuries, the citizens and municipalities of Greater Philadelphia both appreciated and vilified street vendors. Despite fluctuations in regulations and enforcement, the continued presence of vendors and variety of their wares attested to their social and economic importance. Stephen Nepa teaches history and American studies at Temple University, Rowan University, and Moore College of Art and Design. A contributor to numerous books and journals, he also appears in the documentary series Philadelphia: the Great Experiment and The Urban Trinity: The Story of Catholic Philadelphia. Donofrio, Greg. “Attacking Distribution: Obsolescence and Efficiency of Food Markets in the Age of Urban Renewal,” Journal of Planning History 13 (May 2014): 136-159. Harrison, Candice L. “Free Trade and Hucksters’ Rights: Envisioning Economic Democracy in the Early Republic,” Pennsylvania Magazine of History and Biography 137 (2013): 147-77. Hines, Mary Ann. The Larder Invaded: Reflections on Three Centuries of Philadelphia Food and Drink. Philadelphia: Historical Society of Pennsylvania, 1987. Lee, Jennifer. Civility in the City: Blacks, Jews, and Koreans in Urban America. Cambridge: Harvard University Press, 2002. Nepa, Stephen. “The New Urban Dining Room: Sidewalk Cafes in Postindustrial Philadelphia,” Buildings and Landscapes: Journal of the Architectural Vernacular 18.2 (Fall 2011): 60-81. Prowell, George Reeser. The History of Camden County, New Jersey. Camden: Richards, 1886. Smith, Billy Gordon. The Lower Sort: Philadelphia’s Laboring people, 1750-1800. Ithaca: Cornell University Press, 1994. Hucksters and Street Vendors, multiple holdings, Historical Society of Pennsylvania, 1300 Locust Street, Philadelphia. Reading Terminal Market, 51 N. Twelfth Street, Philadelphia. Italian Market, South Ninth Street between Christian and Wharton Streets, Philadelphia.